Adding another feather to its cap, YouthNet Nagaland was declared as one of the 16 winners of the “Social Media Empowerment Awards 2014”. The Award gala was organised by the Digital Empowerment Foundation (DEF) in partnership with the American Centre at Eros Hotel, Nehru Place, New Delhi on November 20, 2014. 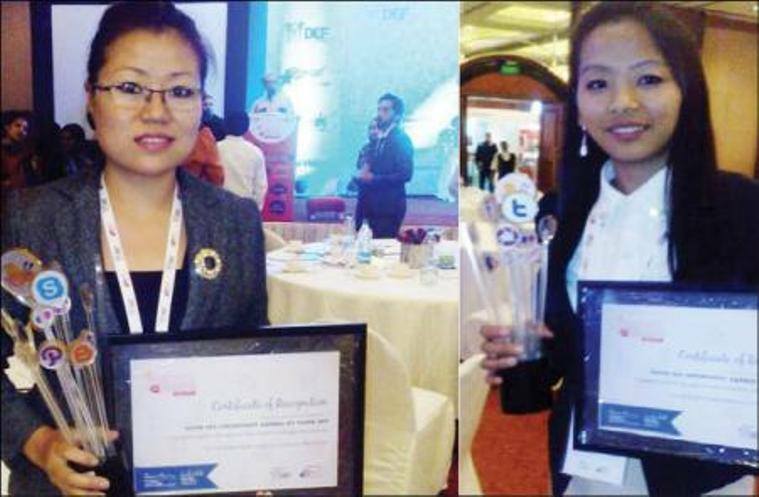 YouthNet Nagaland was nominated amongst 161 entries across India, Afghanistan, South Korea, Bangladesh, Bhutan, Nepal, Pakistan and Sri Lanka. YouthNet was awarded in the category of ‘Communication, Advocacy & Development Activism’ for sharing success stories of young people across Nagaland and building a culture of positive energy amongst the youth across the North-East. Veliitalii Puro and Thejano Yanthan represented YouthNet. The “Social Media Awards 2014” is in recognition for organizations using social media to translate information and communicate to stakeholders through various social media means such as Facebook, Twitter, Instagram, whatsapp and others. In order to promote and encourage education for underprivileged children, YouthNet created a small fund in partnership with The Forgotten International, USA. Under this fund, meritorious and needy students in two schools, namely Mount View School, Suruhuto and Agape School, Kiphire were undertaken. Clothes and shoes were also distributed to students of the two schools in 2010 and also to needy children in around 5 villages. At present, financial assistance for construction of school building of Mount View School, Suruhuto is underway. YouthNet in partnership with the Paper Tigers (USA) also sponsors the “reading in school” programme wherein reading books are contributed to the schools. Partner organizations like The Heritage, Kohima and Synergy Group Enterprise, Kohima also contribute to the Education Fund. YouthNet has also been part of host of other activities like contributing to television talk shows on social change, media interviews for social awareness and contributing as resource persons in the field of law, human rights/children & women rights.